and a local blog entry about the evening as well! Click the link below to read the News and Guide article written about Hole Dance Film’s production of An After Dinner Drink at Rendezvous Bistro in Jackson, Wyoming. The article goes well into our choreographic process, details about the actual shoot and there are some great photos included as well! Winter Migration has been awarded the Visual Arts Award from ARTCORE in Casper, WY. The award will be presented to Hole Dance Films on January 14th when Repertory Dance Theater performs in Casper, WY. Blue’s not the word… is playing May 8th in Temp, AZ! five women in snow pants, hats, gloves, goggles; a wintry alpine setting with snow falling and piled high. But when the women start dancing, and movement mixes the elements on camera, the scene becomes surreal. It’s a new way of seeing modern dance. by Jackson filmmaker Carrie Noel. The showcase opens Friday with a reception from 5 to 7 p.m. in the Art Association’s ArtSpace Gallery. The reception ends in time for Noel’s rehearsal dinner – she is getting married Saturday. The films will play on a loop through June 15 during gallery hours. The gallery staging will accentuate the surreal by recreating the living room setting of another film, Blue’s Not The Word…. Viewers will sit on the same couch the dancer cavorts on, with the same empty red picture frames on the wall. The three films explore the emerging genre, Dance on Camera, through the direction of Carrie Noel and, in the case of Winter Migration and Blue’s Not The Word… , the choreography of Kate W. Kosharek. The pair recently formed their own production company, Hole Dance Films. audience always posed a challenge. Sometimes, the company had to revert to a traditional stage format. Choreographing for the camera freed Kosharek of seating hurdles and allowed her to fully embrace the three-dimensionality of dance. “You can take them on a journey to places they recognize,” which makes the dance more relatable, Noel said. On a snowy, sub-zero weekend in February, they filmed Winter Migration in the web of trails at the base of Teton Pass. At one point, the camera froze. worlds of art and extreme sports. Its score, composed by Kosharek’s brother, Joe Westerlund, accentuates the harsh beauty of the environment. Pre-snow, Kosharek led studio rehearsals, which Noel observed, even filling in for absent dancers, and filmed for angle study. Moving the choreography outdoors required adjustments. The 7-minute film recently placed in the top 11 of the second Wyoming Short Film Contest. Noel recruited film-school friend Natalie Newman as the cinematographer. She shoots live traffic reports for a TV station in Oakland, Calif., and also filmed the third film in the showcase, The Bird Has Flown, which debuted at last year’s Jackson Hole Film Festival. To maximize Newman’s time in Jackson, they filmed both movies in one weekend. Blue’s Not the Word… stars a woman – Kosharek – and her television. Edited as jump cuts, the 3-minute film spotlights the woman’s TV-induced moods. An array of outfits suggest a sweep of time. For dance to tell a story without words, movements must be overexaggerated. “We explore the characters through movement before we even talk about them,” Noel said. “As that movement comes out, they get quirkier and quirkier because you are talking about them through movement even before you talk about their personality or name.” The physical hyperbole allows the audience to adjust to a world without dialogue. “It makes more sense in a surreal environment to have them [moving instead of talking],” as compared to a realistic setting where people suddenly start dancing, Noel said. “It helps the audience accept it.” Noel and Kosharek are already working on their next film – on needing less. “It’s the first time I’ve really been moved to comment on world event through dance,” Noel said. Seeking grant funds, they hope to employ Jackson artists affected by the recession. 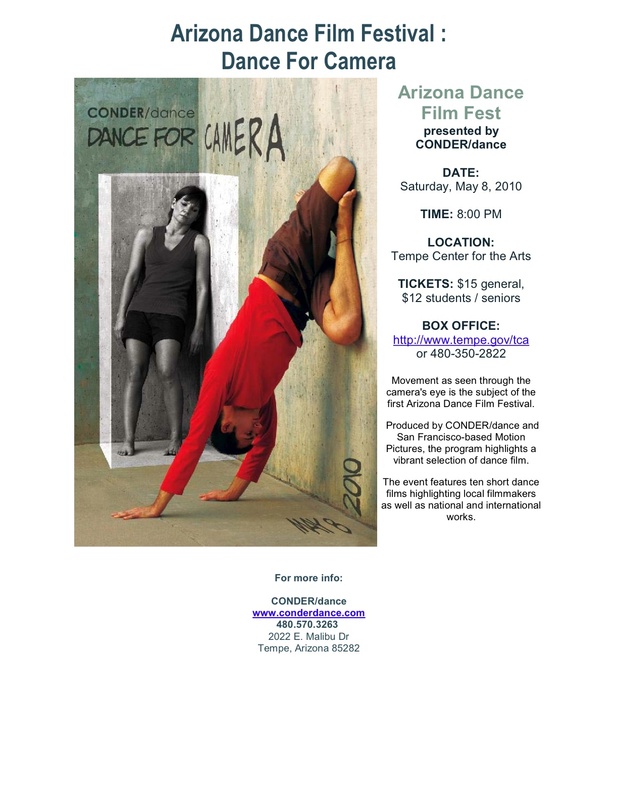 Local Jackson filmmaker, Carrie Noel brings Modern Dance and Film together in the emerging genre of Dance on Camera. Each film utilizes intricate choreography, challenging the age-old tradition of watching dance on stage. This collection of dance films encourages a keen awareness of the magical ways to interpret time, space, energy and story telling. Two brand new short films, recently shot in Jackson with local choreographer Kate W. Kosharek, will premiere in this show: Winter Migration and Blue’s Not the Word… Also included in the showcase is Noel’s This Bird Has Flown. Winter Migration was funded in part by an Individual Artist Professional Development Grant from Wyoming Arts Council (granted to Kosharek). It was also just recently selected as one of the top eleven films in the 2nd annual Wyoming Short Film Contest. 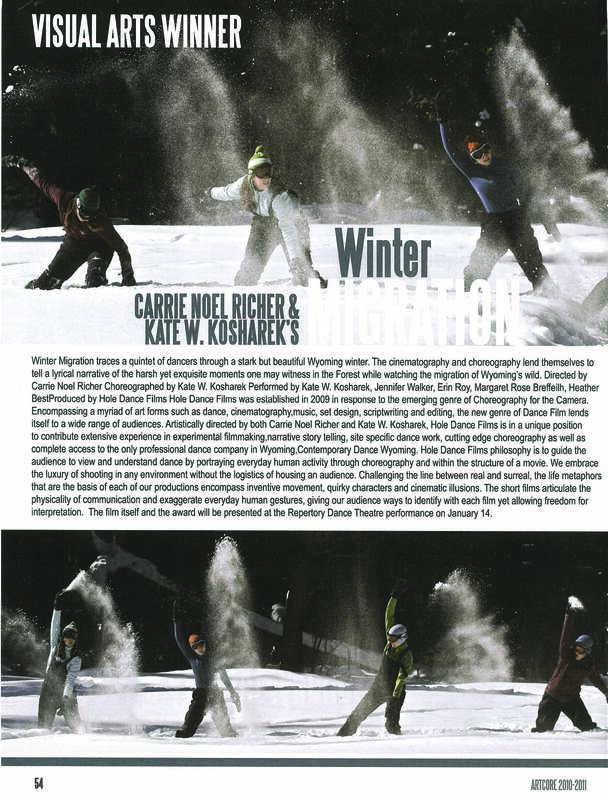 Winter Migration was shot in February 2009 (Wilson, WY) and features a quintet of local Jackson dancers through the starkness of a Wyoming winter landscape. Directed by Noel, Choreographed by Kosharek, performed by Margaret Breffeilh, Heather Best, Jennifer Walker, Erin Roy and Kate W. Kosharek. Produced by Hole Dance Films. Blue’s Not the Word… was also shot in February 2009 (Jackson,WY) and is a film depicting one woman’s relationship with her television. Directed by Noel, Choreographed and Performed by Kosharek. Produced by Hole Dance Films. This Bird Has Flown was shot in 2007 in San Francisco, CA. This short dance film tells the story of the night, and then, the morning that John Lennon wrote ‘Norwegian Wood,’ the Beatles ballad. The story takes place in 1963 when the heroine of this story, Katerina, meets John Lennon on her way home. Directed by Noel, Choreographed by Rachael Lincoln.